Rose Hip extract is high in vitamins A and C and has a strengthening effect on capillaries and connective tissue. 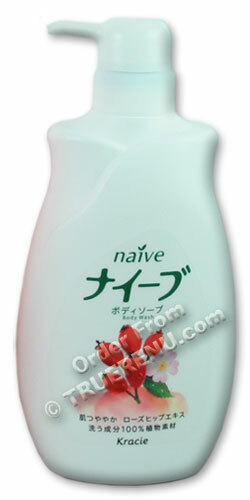 Naive's Rose Hip Body Wash uses rose hip extract for silky, shiny skin, with a light fruity rose scent. A huge bottle and convenient pump will have you swooning at every bath or shower! Cleans, soothes and softens skin with a light fruity fragrance you will love! For super-sudsy emulsion, you can pump a little bit of body wash onto the Salux exfoliating bath towels available from TrueRenu. Kracie's extensive line of body washes provide the variety you're looking for... featuring Aloe, Peach, Lemon, Grape, Green Tea, Yuzu & Honey, Grapefruit and Rose Hips. Ingredients: Water, lauric acid, myristic acid, palmitic acid, potassium hydroxide, propylene glycol, sodium laureth sulfate, glycol distearate, lauramidopropyl betaine, cocamide methyl MEA, cocamide MEA, PEG-4, stearic acid, fragrance, cocamide mea, sodium cocoamphoacetate, PEG-7 glyceryl cocoate, arginine, hydroxypropyl methylcellulose, disodium EDTA, sodium chloride, PEG-7M, polyqaternium-7, guar hydroxypropyltrimonium chloride, butylene glycol, tetreasodium etidronate, glycosyl trehalose, hydrogenated starch hydrolysate, sodium citrate, hydrolyzed oat protein, rosa canine fruit extract, methylparaben, aluminum hydroxide, propylparaben, red.33 (CI 17200), red 4 (CI14700), phenoxyethanol.